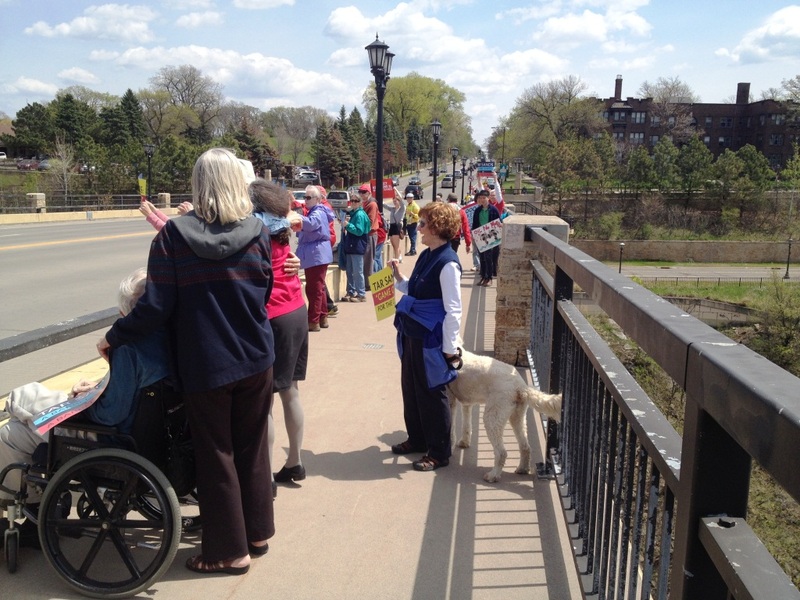 Minneapolis, MN – As part of a national day of action, more than 130 residents of the Twin Cities and surrounding metro areas met at the Lake Street/Marshall Bridge today. They gathered to ask the president and local officials to reject the Keystone XL pipeline and other dirty fuel projects like the Alberta Clipper here in Minnesota that threaten our communities and destabilize our climate. Enbridge, the leading pipeline operator in Canada’s oil sands region, is asking the MN Public Utilities Commission (PUC) to double the capacity of an existing northern Minnesota tar sands pipeline, the Alberta Clipper, to carry nearly as much tar sands oil as Keystone XL. The Alberta Clipper feeds pipelines that stretch all across the Midwest, and an expansion would put rural communities, waters, and lands at greater risk of toxic spills and other hazards. If the Alberta Clipper is approved, other pipeline proposals such as the Sandpiper – a 610-mile crude oil line, which would run across Minnesota – are poised to move forward. As millions begin to understand that we must keep dirty fuels in the ground if we are to have any hope of halting climate change, there’s a rising tide of grassroots activism demanding that we choose a clean energy future over the dangerous and dirty fuels of the past. 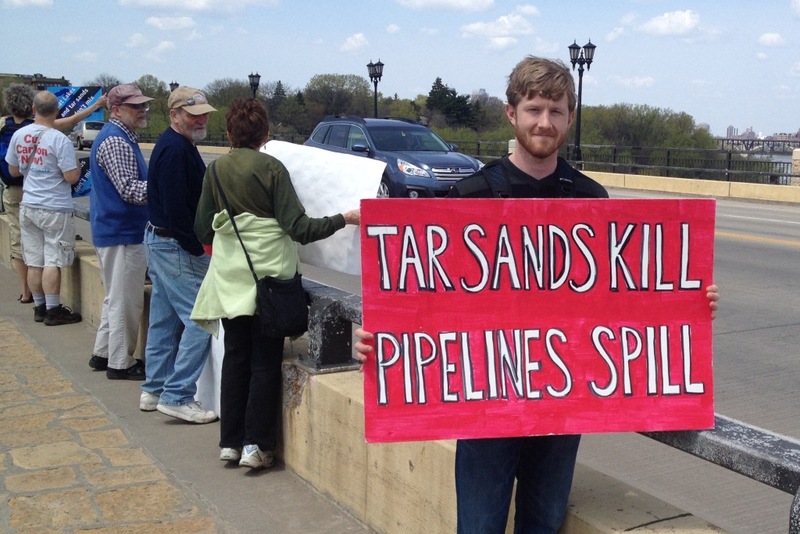 The event was locally organized by the Sierra Club North Star Chapter and MN350, and nationally by the Tar Sands Coalition and Hands Across the Sand / Hands Across the Land. Hands, founded in 2010, grew into an international movement after the BP oil disaster in April of that year, during which people came together to join hands, forming symbolic barriers against spilled oil and the impact of other forms of extreme energy. More than 100 similar events were held across the country and around the world by Hands Across the Sand/Land and other groups. Thousands of citizens joined against a range of dirty fuel projects from the Keystone XL pipeline, to offshore drilling and seismic testing, hydraulic fracturing and LNG export terminals, tar sands mining and crude by rail, and mountaintop removal coal mining. The events also highlighted the impacts of climate disruption– rising sea levels, drought, forest fires, ocean acidification, crop loss and flooding. “Northern Minnesota is facing an incredible number of tar sands and extreme energy expansion projects right now, from Enbridge’s Alberta Clipper to Line 3 and Sandpiper. Most of these lines cross the Mississippi River,” said Andy Pearson of MN350. The events are aimed at steering America’s energy policy away from its dependence on fossil fuels and towards clean energy. The goal is to show leaders in all levels of government that public support is strong for moving away from dirty fuels and adopting policies that encourage clean energy instead. This week’s National Day of Action is another manifestation of a growing movement demanding that our leaders act quickly and boldly to address climate change. It comes in the wake of the Department of State’s recent announcement that it was extending its review of the pipeline, and the Reject & Protect encampment in Washington, DC which dramatically highlighted the opposition of farmers, ranchers and Native Americans who would be directly impacted by the pipeline, In early March, Keystone activists presented the Administration with over 2.5 million comments opposing the pipeline. What: Minnesotans will join hands across the Lake Street-Marshall Ave bridge that links the Twin Cities across the Mississippi River, symbolically blocking the proposed expansion of three northern Minnesota pipelines that would cross the Mississippi. Large posters will bring back the memorable “Burma Shave” sign format to highlight creative messaging! Sponsors: North Star Chapter (Minnesota) of the Sierra Club, MN350 and a long list of national partner organizations. Three weeks after the powerful “Reject and Protect” encampment in Washington, DC, and two weeks after release of the National Climate Assessment, Americans will take to bridges, beaches, refineries, and government offices to ask the president to reject the Keystone XL pipeline and other dirty fuel projects that threaten our communities and destabilize our climate. Urban, suburban and rural, ordinary citizens will urge our leaders to accelerate the transition to clean energy. The event follows efforts this week in Minnesota by the oil industry to weaken a House-passed and Governor-supported measure that would provide more safety oversight and better response time for pipeline and railroad explosions and fires arising from the transportation of dirty fuels throughout the state and in the heavily populated Twin Cities area. Minneapolis, MN – A growing coalition of organizations and transit riders launched a campaign and website on Thursday to promote a new dialog around construction of the Southwest light rail as the municipal consent process of public meetings gets underway. The first is a public forum in North Minneapolis to be held at Minnesota Neighborhoods Organizing for Change (NOC) between transit riders and Met Council members on Saturday afternoon, May 10. “While Southwest light rail wasn’t built with our community in mind, it has the potential to improve racial and economic equity in Minneapolis and across the region. But not unless we negotiate improvements that benefit lower-income transit riders and which address persistent inequities across the city of Minneapolis and our region,” said NOC Executive Director Anthony Newby. The website, PeoplesTransit.org, was launched by NOC, TakeAction Minnesota, ISAIAH, the Sierra Club and the Harrison Neighborhood Association to promote an array of equity enhancements the Met Council, City of Minneapolis and Hennepin County should embrace as they enter mediation and the process of gaining municipal consent. The coalition says equity concerns must be placed at the center of the debate and move past the protracted infighting over the Kenilworth corridor. “We believe SWLRT is a crucial opportunity for communities who rely on public transit but who are always left out of the conversation. We want to make sure these individuals have a voice at the negotiating table as decisions about SWLRT are finalized,” said Doran Schrantz, Executive Director of ISAIAH. People’s Transit is a coalition of individuals and organizations working to ensure equity is placed at the center of the Southwest Light Rail (SWLRT) debate. We see smart transit policy as a crucial opportunity for increasing economic opportunity and achieving racial equity across the city of Minneapolis and our region. MINNESOTA — Today citizens delivered oversized health ‘bills’ to two Minnesota utilities — Xcel Energy in Minneapolis and Minnesota Power in Duluth — charging them for the costly health and environmental impacts of fossil fuel pollution. These utilities are required to factor in pollution costs into their energy decisions using state estimates, but the cost values are close to 20 years old and do not reflect the known health effects of coal pollution. A recent study found fossil fuel pollution costs Minnesotans $2.1 billion in health and environmental impacts – 94 percent from coal pollution. This year the Minnesota Public Utilities Commission agreed to study these impacts and determine how to updates the cost values to reflect current science. Community members are seeking to ensure the hidden costs of coal pollution are included, such as emergency room visits, medical bills and missed school days. Xcel’s coal pollution costs Minnesotans as much as $1.4 billion each year in health and environmental impacts. Meanwhile Minnesota Power’s coal pollution costsas much as $615 million each year. These estimates do not include mercury pollution, which also takes a toll on Minnesotans health, lakes and wallets annually. In late March, the Sierra Club put Minnesota Power on notice for more than 12,500 federal Clean Air Act violations at its Clay Boswell, Taconite Harbor and Syl Laskin coal plants over the last five years, which have threatened public health. Maps from a new report show dangerous levels of sulfur dioxide pollution emitted by the Taconite Harbor plant. The Clean Air Task Force estimates that Minnesota Power’s Clay Boswell, Taconite Harbor and Syl Laskin coal plants contribute to a combined 367 asthma attacks, 36 heart attacks, and 23 premature deaths per year. The elderly, children and people with respiratory and heart disease are most at risk. Minnesota Power’s coal plant pollution — including soot, sulfur dioxide, nitrogen oxide and carbon dioxide. Xcel’s Sherco coal plant in Becker, Minn., emits 12,000 tons of nitrogen oxides (NOx) & 20,000 tons of sulfur dioxide (SO2). Soot and smog pollution from coal plants contribute to significant health impacts, including asthma, lung cancer and other respiratory ailments. A study by the Clean Air Task Force study found that particle pollution from Sherco leads to an estimated 1600 asthma attacks, 150 heart attacks and 92 deaths each year. Minnesota — A national committee of experts in agriculture, climate science, commerce, and disaster relief released its National Climate Assessment (NCA) today. The report is the nation’s foremost comprehensive, peer-reviewed analysis of the impacts of climate disruption, showing us the effects of climate change in Minnesota and across the country. The report shows the significant toll on our health and wallets that extreme weather is already exacting, and it also makes clear that these impacts will only grow worse if we fail to curb carbon pollution, the main culprit behind climate disruption. Minnesota is part of the NCA’s Midwest Region, which predicts that direct effects from climate change will include increased heat stress, flooding, drought, and late spring freezes, altering ecosystem and socioeconomic patterns and processes in ways that most people would consider detrimental. Warm-season events, such as the large-scale flooding that occurred in Rush Creek and the Root River in Minnesota in August 2007, and multiple rivers in southern Minnesota in September 2010, are projected to increase in magnitude. More than 240 authors from across the country with diverse expertise helped create the National Climate Assessment. The findings are considered conservative estimates of the impacts of climate disruption.